Industry expert with award winning truss booth design and combined 30+ years of experiences. TK truss kit today, and remember no matter the size you can always readjust with a snap. As your company grows, you can easily add more parts or reconfigure your booth to fit your needs. Our design team will always be here to help you reach your visual goals - it just keeps on getting better! Versatility is affordability. 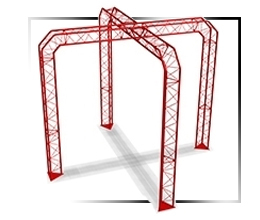 Trusskits.com proudly features the TKtruss line of truss kits, a NO TOOL NEEDED truss system. Seriously, you don't need a single tool besides your hands! Simply insert the Patented Knob and Pin Connectors into any various TKtruss section (the lineup pins automatically engage), creating perfect truss section alignments. All connectors can be tightened by hand. Available in 6" Box and 8" box truss systems. 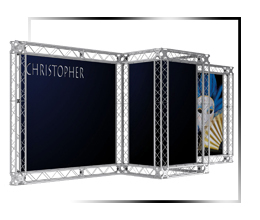 TKtruss displays are the fastest assembling truss Displays available anywhere. The Knob and Pin Connectors make it possible to assemble two sections of TKtruss in less than 15 seconds. Just a line the truss sections face-to-face (the lineup pins will automatically engage), insert the connectors into both sides and you're ready to go! 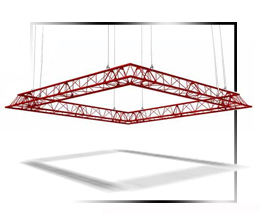 You'll have a fully assembled truss section in seconds. All TKtruss displays are built to last. 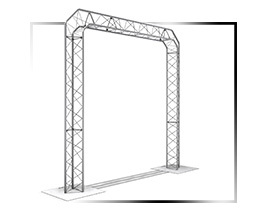 TKtruss display booths are made of tubular aluminum or steel, TIG or MIG welded, and power coated for durability and reliability. TKtruss kits can support any accessory combination you want: graphics panels, LCD or plasma monitors, shelving, table tops, signing and more. Need a custom product display for your next event? Call us for free 3D CAD design and a list of our great accessories. The TKtruss design ensures your exhibit and will be sturdy, solid without sacrificing the look and convenience of a modern, portable display. Trusskits.com | 800-522-2326 is here to assets you in Designing and developing your Trade show Display or Exhibit. We offer FREE Design help, FREE 3D CAD Renderings and Custom Metal Fabrication. We have in stock, Americas largest American made selections of Display Truss and Truss Kits. These trusses are made of steel and/or aluminium and will be Powder Coated in your chose of seven standard COLORS, Custom colors are also available. Trusskits.com can be your Exhibit Display Resourcing and Procurement Partner. Thinking about Renting? Why when you can purchase your Display for the same price or less! Trusskits.com can store your display between Trade shows in it's 40,000 sq ft facility in South San Francisco CA. We can then: Repack your booth to your requirements and instructions. 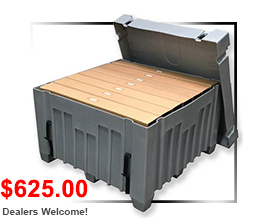 Own without the hassle of storage, staging and shipping, we at Trusskits.com | 800-522-2326 can do it all for you, give us a call and ask about our Show storage and fulfillment program. 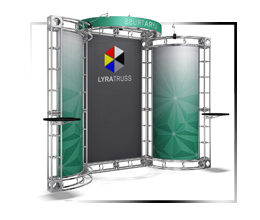 Trusskits.com is here to assets you in Designing and developing your Trade show Truss Display or Truss Exhibit. Regardless of the size: Tabletop Display, Pop Up back walls, 10' X 10', 10' X 20', 20' X 20' or 30' X 30' or larger Island truss booths, if it is a large Outdoor truss Exhibits that can cover a few cars or a parking lot, whatever you may need we can HELP! 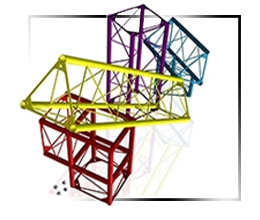 We also offer FREE 3D CAD Service, Custom Metal Fabrication, Americas largest selections of Display truss kits available made of steel or aluminium in any color made in the USA. Trusskits.com can be your Product Resourcing and procurement partner, we can also Storage for your Truss Displays or Truss Exhibits between shows. 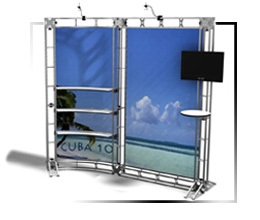 Trusskits.com | 800-522-2326 is truly a Full Service Trade show display Supplier. Trusskits.com | 800-522-2326 is your partner in the Trade show and Exhibit industry. Our company has been in the Trade show business since 1983! 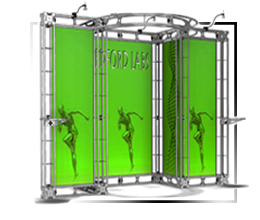 We search all over the America for products that will help you achieve your goals, may it be a Truss Display system build in California or Pop-up Back walls from the Mid west. Most of our products are 99.95% GREEN and are built in the USA!